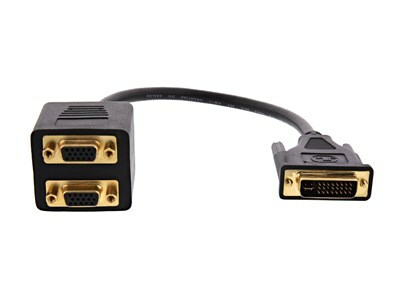 The Computer Cable Store™ DVI Adapter - DVI-A Male to 2 VGA Females - 1 FT DVI/VGA Splitter cable provides a fast and easy way to simultaneously connect 2 VGA displays to a single DVI-I source. This DVI Adapter - DVI-A Male to 2 VGA Females - 1 FT cable is made form the highest quality components to provide crystal clear video transmissions. With support for high-resolution images, this cable is ideal for presentations. Step 1 - Connect your devices with this splitter cable. Step 2 - Turn the signal source on(ex. DVD player). Step 3 - Turn display A on first and wait until it works properly. Step 4 - Then turn on display B and enjoy.